The SSC CHSL Tier I Exam has commenced today. This exam is scheduled to take place from 4th to 26th March 2018 in three shifts each day in various centres across the country. 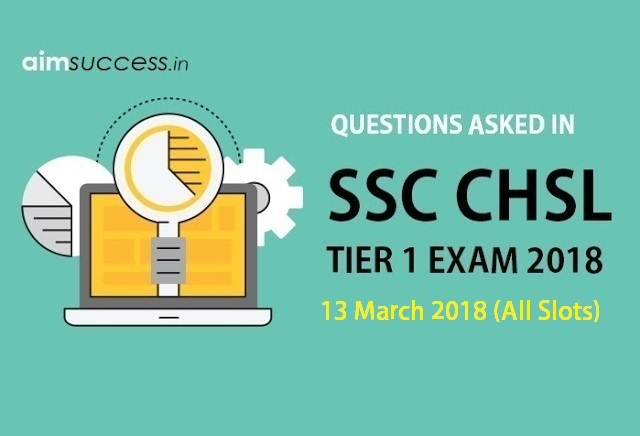 Go through the Questions Asked in SSC CHSL Tier 1: 13 March 2018 (All Slots). This includes types and number of questions asked and weightage of different topics from different the sections. Take a glance at the list of questions will help to get an idea about the types of questions that could be possibly asked in the coming SSC CHSL Exam. Please check the section wise questions asked in All Slots.Our team is updating Questions every Hour so keep visiting for more questions..
Line of Capricorn dies not pass in the following country ? One question related to Khelo India? Which country has launched the world’s first fully electric cargo ship? 1. If x = 222, y = 223, z = 225, then find the value of x3 +y3 + z3 – 3xyz = ? 2. Perimeter of two similar ΔABC and ΔPQR respectively 60 cm and 36 cm. if PQ= 18 cm Then AB = ? 3. Average age of three friends is 23 years. if ages of 4th friend is added in the average age of three friends. what will be the age of 4th friend ? 4. if 4x + 1 / x =5, then calculate the value of 5x / (4x2 +10x +1) = ? 5. if 35 men complete the work in 8 days. then how many men will be need to complete the work in 10 days ? 6. A shopkeeper sells a thing of face value Rs. 20,000 at discount 7%, what is selling price of thing ? 7. A Sound travels 330m in 1 sec. when Sound hear after 10sec of shining of a Light. What is the distance of cloud in Km? 9. Average of 100 car is 40,000 and average of 60 car is 30,000. Find average of remaining cars? 10. In PQR triangle, TanP = 24/7. Find CosR. 11. Sin60° – 2/√3 . Where is Niger River? Ans – Guinea Highlands in southeastern Guinea. Where is more speed of light? Ans – Vacuum. First Inauguration of commonwealth game is done in which year? August 1930. Hope you find this post is helpful, If you remember questions from your SSC CHSL exam then please share them in the comment below.